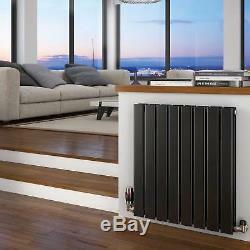 HB Signature Typhon Black Horizontal Designer Radiators. Single and Double Panel options available for every size. Manufactured in accordance with BS EN 442. Supplied with wall mounting brackets and fixings. Simple, understated elegance and clean lines come together to create a modern design classic. The Typhon Black Horizontal radiator has to be one of the most sublimely stylish radiators on the market today. This powder painted steel radiator has a perfectly even finish and is ideal for ultra-chic contemporary spaces, or as a bold and unexpected focal point in a monotone retail environment. From minimalist lounges to super-hip restaurants, the Typhon Black Horizontal is equally at home in any modern space. Crafted from high-grade steel and using 60mmmm x 12mm tubes - which are the biggest of their type on the market - these radiators also combine functionality with fabulous looks. The larger surface area and the fact that they are painted mean that they radiate more heat, allowing you to regulate the temperature with a greater degree of control. The thicker tubes also reduce the chances of leaks or corrosion. With a 15-year guarantee, full CE approval and EN442 certification, you can be absolutely certain that you're getting the very best quality at an affordable price. Get the designer look without the price tag with Typhon Black Horizontal radiators. Range of standard and thermostatic valves available separately. Designer Radiators and Single or Double Panel - Explained! Rest assured the Designer radiators have been manufactured to combine both functionality and stylish design, so you wont go cold in the winter months. Unlike Column and Convector Radiators, a lot of the Designers come in Horizontal or Vertical Orientation. The Verticals can be the perfect solution when trying to maximise wall space in your home, while the Horizontals are modern and stylish, but more traditional in orientation and release heat in the same method as the convector radiators do. Whereas, a Single Panel Radiator only has one panel which faces away from the wall. Because the design puts one panel behind the other, the height and width of the radiator will stay the same whether you choose single or double panel. Compared to the Single Panel options, the Double Panels will produce more heat because they have more surface area to warm the air in the room. You should bear in mind that this extra heat from a Double Panel will come at a higher cost. Heat Output BTU (Delta T50). Heat Output BTU (Delta T60). Heat Output Watts (Delta T50). Heat Output Watts (Delta T60). 600mm x 544mm Single Panel. 600mm x 816mm Single Panel. 600mm x 1020mm Single Panel. 600mm x 1224mm Single Panel. 600mm x 1496mm Single Panel. 600mm x 544mm Double Panel. 600mm x 816mm Double Panel. 600mm x 1020mm Double Panel. 600mm x 1224mm Double Panel. 600mm x 1496mm Double Panel. Please allow extra time if you are paying by cheque. Or you can collect from us. This means that you do not have to wait in until your goods arrive. If the towel rail / radiator has connections at the sides. You will need either angled or corner valves, angled if your pipes are coming from the floor as this will provide a 90 degree angle into the side of the radiator. Corner Valves if your pipes are coming from the wall this will also give a 90 degree angle into the side of the radiator however is the neatest solution with this type of configuration. The item "Matte Black Horizontal Designer Radiators Central Heating 15 Year Guarantee" is in sale since Friday, September 1, 2017. This item is in the category "Home, Furniture & DIY\Heating, Cooling & Air\Air Conditioners & Heaters\Radiators". The seller is "essentialshoppinguk" and is located in Colchester, Essex.